South Korea’s leading mobile game developer Netmarble Games on Thursday announced that it will launch “Lineage II: Revolution” for mobile devices in Korea in October. “Lineage II: Revolution” has sought to optimize the original online game to fit mobile devices while offering the same high-quality graphics, character options and game play formats offered by the game’s PC version, Netmarble said. The new mobile game’s most touted feature is the “Castle Siege” -- an integral element of the original “Lineage II” -- which can at once accommodate up to 1,600 players engaged in multiplayer battles to win over a clan’s castle. Netmarble decided to launch the mobile version of “Lineage II,” eyeing the future expansion of the MMORPG game format in Korea and around the world including China, where the game genre is already widely popular, according to Baek Young-hoon, the chief operating officer of Netmarble Games. 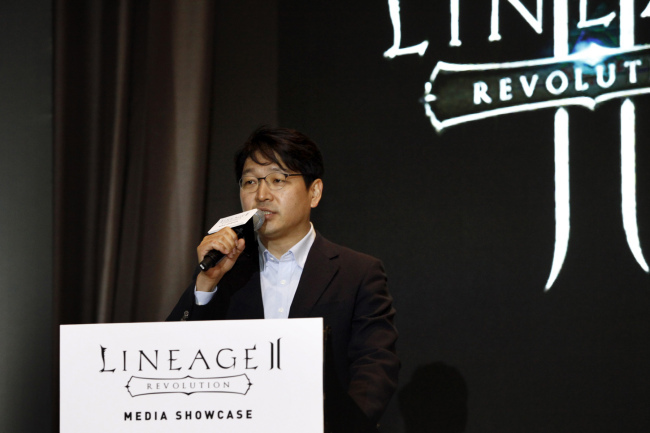 “Our goal is to make ‘Lineage II: Revolution” the most beloved mobile game in the history of Korean mobile games,” Baek told reporters during a press conference in Seoul to share the firm’s vision for the game. Starting with the domestic release of “Lineage II: Revolution” in October, Netmarble plans to bring the new mobile game to other major gaming markets around the world. It is looking to release the game in China by early 2017, followed by Japan and other major markets abroad in the future. “We are already working with our local partner Tencent to prepare for the game’s Chinese launch, which includes efforts to localize certain aspects of the game to best accommodate Chinese users,” Baek said. Despite fierce competition from Chinese MMORPG game developers, Netmarble believes it can win over users with its strengths such as advanced graphics and lively action features, the Netmarble COO said. “Lineage II: Revolution” was developed by Netmarble Games’ development unit Netmarble Neo -- a company formed last year through the merger of Netmarble with three local game developers Turonon Games, NuriN Soft, and ReBORN Games in 2015.